Auf zahlreichen europäischen Fernverkehrsrelationen ist die Bahn in vielen Fällen die günstigere Mobilitätsalternative als das Flugzeug. 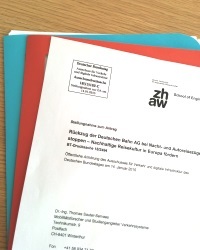 Dies zeigt eine Studie, die Thomas Sauter-Servaes gemeinsam mit der Hamburger Quotas GmbH im Auftrag des internationalen Eisenbahnverbandes UIC durchgeführt hat. 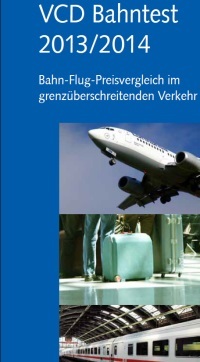 Weitergehende Analysen machen deutlich, dass insbesondere Geschäftsreisende hohe Beträge sparen können, wenn Sie mit dem Hochgeschwindigkeitszug auf Flughöhe Null reisen. Welche Herausforderungen und Chancen sich für die Bahnbetreiber ergeben, wird im Artikel „Zug schlägt Flug“ anschaulich erläutert. Train travel in Europe, in the public’s view, suffers from extraordinarily high fares. This contrasts strongly with air travel, where liberalisation of the European passenger aviation market has led to cut-throat price competition on many domestic and international routes. As a result, the airlines offer extremely low fares that are heavily promoted and advertised. Despite the fact that only small numbers of tickets are available at these low prices, these airline marketing activities have had a strong influence on the public perception of inter-city rail fares. The airlines’ advertised starting prices have become an important reference point for consumers’ price assessments of competing travel modes, and the assumed price advantage of air travel affects their booking behaviour. Expecting to find the best travel prices at airlines, consumers tend to narrow their search to online flight-booking engines such as Kayak, ebookers and eDreams. As most of these online tools do not offer any price comparison between modes, the majority of travellers do not even bother to check rail fares. To make matters worse, travellers usually compare the journey times of air and rail without taking into account the additional access and processing times at airports — which is likely to increase further as a result of recent events. This is the background to a 2014-15 study commissioned by the International Union of Railways entitled European Air-Rail-Bus Price Comparison. The purpose of this study was to review current ticket prices for rail, air and coach travel on selected domestic and cross-border routes, where air and rail are comparable thanks to similar overall travel times. Do travellers really obtain the best price by going with a so-called low-cost airline? Or could they save significant amounts of money by choosing rail over air? Den kompletten Artikel finden Sie in der Januar-Ausgabe der Railway Gazette ab Seite 49. Auf der Open Innovation Plattform MovingIDEAS sucht die Deutsche Bahn AG nach innovativen Lösungen für einen besseren Schienenverkehr. Im Rahmen der Kampagne „Neue Energie für die Schiene – Power to the rails“ waren Ideen gefragt, wie der Schienenverkehr weitaus weniger CO2-Emissionen emittieren könnte – ohne dabei an Leistungsfähigkeit und Servicequalität einzubüssen. Der erste Preis ging an das Konzept „DB Renewables Club“ von Thomas Sauter-Servaes. Der „DB Renewables“ Club will Kunden die Möglichkeit bieten, sich an „Erneuerbare Energien (EE)“-Projekten auf DB-Flächen zu beteiligen. Auf einer Crowdfunding-Plattform sollen diese in von der DB oder von ihr eingesetzten Projektpartnern initiierte Projekte investieren können. Ziel ist es, sich im Themenfeld EE deutlich als relevanter „Enabler“ und „Treiber“ über Demonstrationsprojekte hinaus zu positionieren und die eigenen Kunden aktiv in die DB-Aktivitäten zur Energiewende einzubeziehen.